Born to Buy: What's in my Handbag Makeup Bag? I used to think people were crazy when they said they had a make up bag within their bag - I mean, who needs to take THAT much stuff with them? It turns out they're not crazy, they're super organised, and I've decided to jump on the bandwagon to clean up the mess that is my handbag. The make up bag I use is the Cosmetics Bag from Essence's latest trend edition, Ready for Boarding, and is the perfect size for my handbag. This small cosmetics bag retails for $4.95. 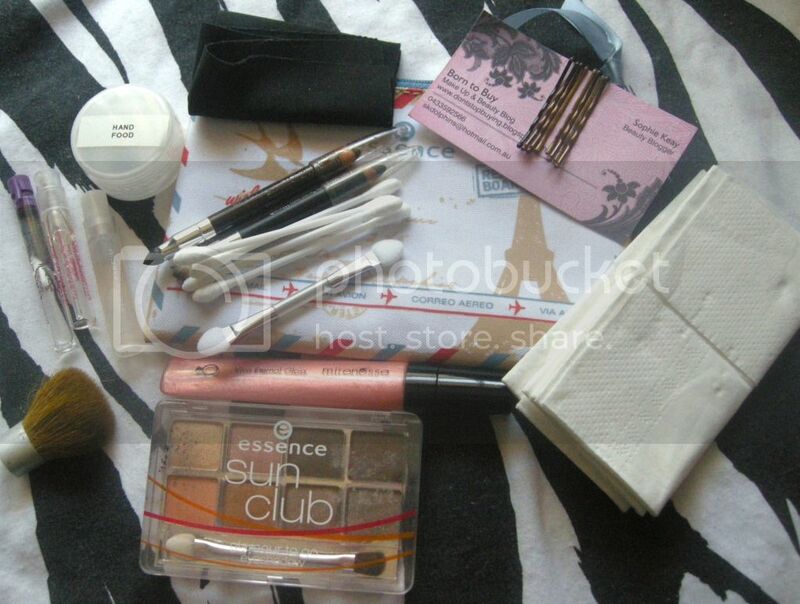 Cotton buds and eyeshadow sponge: Although the Essence palette contains a small double ended brush, I threw in some cotton buds and the double ended sponge applicatior from the Essence Ready for Boarding Beauty on Tour palette 'just in case'. Bobby pins: I always have bobby pins in my hand bag. It goes without saying. Instead of having them floating around my handbag, I put them on one of my blog business cards to keep them altogether. Glasses cleaner: The black thing in the top left hand corner of the photo is a fold up glasses cleaner. Although I don't wear them as much as I should, I have glasses for reading, as well as sun glasses, and there's nothing worse than putting them on and finding that they're dirty! So, ladies and gents, that's everything in my hand bag. As you can see, I just like to be prepared and know I'm going to be able to rescue myself from any beauty emergencies that may arise. What do you always keep in your handbag, beauty or otherwise? Do you have any tips and tricks for what to have in your handbag? I'd love to know! Also, what's your favourite use for small cosmetics bags? im definitely a bag within a bag person lol. right now i got baby stuff like diapers wipes bibs dummy etc haha. not very exciting i admit! I've just jumped on the bandwagon, Mandy, but it makes me feel so organised! I actually keep the Ready for Boarding Hand and Body wipes in my bag too, they just don't fit in the little make up bag. I'm not really a makeup bag in my bag kind of person. That would make my bag too heavy when it's already bordering on it!